Farm Spot is a Community Supported Agriculture (CSA) program started in Jackson Heights in 2006. Members of Farm Spot pay our farmers, Golden Earthworm, in Long Island an annual membership fee to cover the production costs of the farm. In turn, members receive a weekly share of the freshest local produce during the growing season. The primary share is a vegetable share which runs for 26 weeks. We also offer a fruit share (from a neighboring farm, 20+ weeks). This year, beginning May 26th and ending on November 17th 2016, Farm Spot members come to St. Mark’s Church (33-50 82nd Street) on Thursdays anytime from 5:30-8:15 p.m. to pick up their produce. Since Farm Spot is a volunteer-run endeavor, each member is asked to give a minimum of 4 hours of their time during the year to keep the CSA running. Volunteer responsibilities primarily involve working a 2-hour shift at weekly distribution, but can also be fulfilled by participating in data entry, special events, etc. This is the standard 26-week membership share. 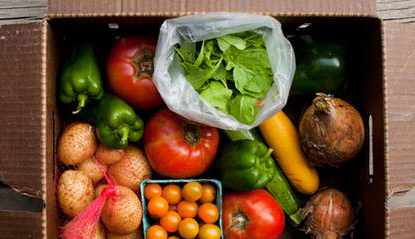 This share contains 6 to 10 types of produce each week. The amount is enough to feed a family of three to four for a week. Many Farm Spot members split one share between two households. (Please note that members organize this on their own and Farm Spot does not coordinate half shares.) $587.08/26 weeks (May 29th through November 20th, 2014). Farm Spot remains committed to making our CSA financially accessible to our neighbors, and we are once again able to offer 15 subsidized shares for the upcoming season. The subsidies are funded by your fellow Farm Spot members. This year we’ve made some changes to the qualifications to increase access for people needing more financial assistance, so please read the following carefully before submitting your registration. For more information on subsidized click here.